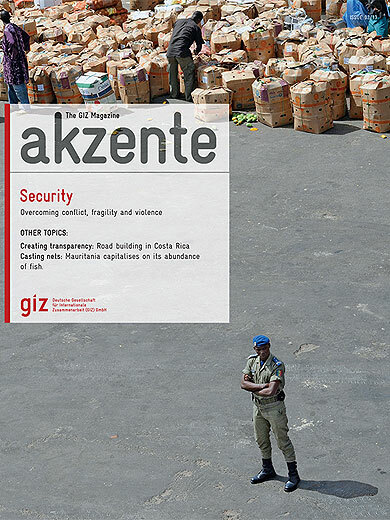 akzente covers societal, economic and political developments over a longer period of time. If you would like to get a hold of older articles you can find them in our extensive archive, which contains the current and previous issues of the magazine. ‘The chinese dragon breathes fire’ is just one example of the many fear-inducing metaphors for China. They often oscillate between worry and respect, and usually have something to do with size, mass, economic clout and political influence. And the underlying reason is almost always a fear of being backed into a corner oneself. China’s development is breathtaking and worthy of superlatives. In just a few decades, the country has transformed itself from an isolated and agriculture-based planned economy into a first-rate production and export hub. It has fought poverty, is now the world’s second largest economy after the USA and has demonstrated enormous innovative strength. What is more: China has transformed itself from a recipient into a donor country, from a largely inward-looking nation into a global power with leadership aspirations – while maintaining an air of both fascination and mystery. Reason enough for us to take a closer look at the ‘China phenomenon’. 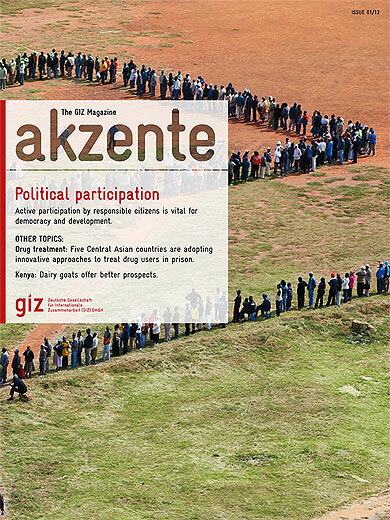 Even if it is unusual for akzente to focus on just one country. Especially since Germany’s traditional development cooperation with China ended in 2009. Our rationale is that, as a development organisation that operates across the world, China’s ambitions often affect us directly. Whether in development projects in Africa, in global climate change mitigation, or in international trade or supranational health issues – without listening to and recognising China’s perspective, it will not be possible to find solutions to the major challenges of our time. It is therefore all the more important, in our opinion, to take a closer look at this still widely unknown actor on the international stage; critically and sympathetically, but also objectively and discerningly. And to refrain from jumping to the same, often short-sighted conclusions. 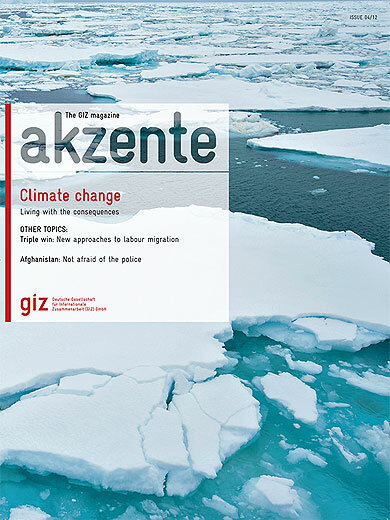 We hope that this issue of akzente can contribute to this. China expert Professor Eberhard Sandschneider explores the misconceptions and illusions about the country in his analytical essay. One of his conclusions is that China will not allow itself to be stopped or limited. He therefore recommends engaging with this internationally active and self-assured nation in as informed and constructive a way as possible. And, from GIZ’s perspective, I would like to add in this context: while actively upholding our values and, where necessary, defending them. 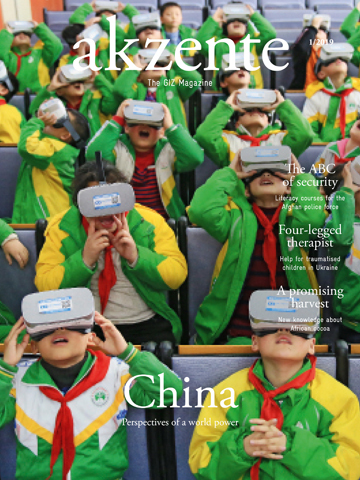 To cast as wide a light as possible on China, this issue’s ‘In focus’ section includes not only an essay on the country, but also an interview with Chinese economist Zheng Han as well as a report on electro-mobility and countless surprising views, facts and figures about China and its people. We hope this will open your eyes to one or two new and perhaps surprising things about China. Because, in the words of the Chinese philosopher Confucius: to think and not study is dangerous. It’s time for an issue on women. 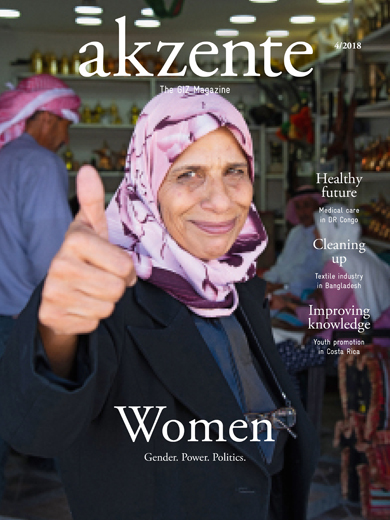 That was the verdict reached by akzente’s editorial team at an all-female meeting held a few months ago. With the 100th anniversary of women’s suffrage in Germany on 12 November, there seemed no better occasion to take stock of how things stand with regard to gender equality around the world. What progress has been made towards emancipation during this dramatic period in which so much has happened – two devastating world wars, but also international cooperation on an unprecedented scale; extreme poverty, but also unparalleled prosperity and huge technological advances? What role did women play in all these momentous developments, we asked ourselves? And we all quickly agreed that the issue of women’s rights belongs at the heart of any analysis of recent history and current affairs. In the field of development policy, in particular, we know that without women, there is less progress. Without female participation in decision-making processes, there is less development. But that was where the consensus among the women on the editorial team ended. Some team members were of the opinion that equal participation is a basic right and, as such, an aspirational goal in itself, while the others maintained that women in positions of power have no inherent value in themselves. They have to make a difference and act more fairly, maintaining higher social and moral standards. Do they? And if so, how? The more we discussed, the more exciting and relevant we found the topic. And the more we argued among ourselves. Especially since it quickly became clear that little information is available from an international perspective. We therefore asked German-American scholar Malliga Och to cast an analytical eye on the issue of gender around the world. In this issue’s cover story, she looks at where women currently hold top political posts and why Western Europe offers women the best chances of embarking on a career in politics. She also explores whether or not women take a different approach to governing. One woman who knows all about this is Michelle Bachelet, former president of Chile. In our interview, she reveals what advice she would give women looking to enter politics: primarily, do not let your guard down and keep your eyes and ears open. In the spirit of greater openness, we have also taken this opportunity to cast a critical eye over our use of language in akzente. The aim is – and on this point we all once again agreed – to use modern and inclusive language, but not to be stifled by political correctness. A difficult balancing act, but one that we strive to perform well. More than anything, we hope that you all – men and women alike – will find the topic of gender rewarding and that you will enjoy reading this issue. In our culture, the phrase ‘I’m occupied’ generally means ‘I’m busy, I have things to do – please do not disturb!’ But it can also mean ‘I’ve got a job’, ‘I’m employed’. And saying that something is ‘occupying’ my mind means that I am pondering over that particular issue. The term ‘occupation’, which is partially synonymous with ‘employment’, has many different connotations. That became clear to us when we were planning this issue of akzente. How could we do justice to all these shades of meaning, given the constraints on space? Eventually, we decided to focus on employment and occupations in the sense of jobs and work – and specifically on work that generates an income. This is, after all, the form of occupation that tops the agenda in our partner countries, because it creates prospects for individuals to escape poverty. But jobs are in short supply in virtually every country around the world, particularly secure and appropriately paid work. The official figure for those in precarious employment has risen over recent years to around 1.4 billion people. Meanwhile, digitalisation has the capacity to reduce job opportunities even more or to transform them radically, as machines decide when crops are ready for harvest, computers perform banking transactions and robots take over domestic work. World Bank economist David Robalino from Ecuador reflects on how to tackle the global employment crisis in our essay. Yet work does far more than merely provide us with an income. It structures our time and enables us to be productive and innovative and to feel needed. That’s been Mohammad Mahmood Ibrahim’s experience. An Iraqi national, he was a Peshmerga fighter but had virtually given up after being injured in the war. It is a huge challenge to start afresh in a crisis zone. ‘Despair doesn’t come close to describing how I felt,’ he says. But with international support, he has been able to open a small shop in Erbil, enabling him to make a new start. And, he adds, the shop has been a salvation for him and his family and has restored meaning to his life. Effective strategies for combating youth unemployment are the focus of a report from Tunisia. An alliance of private and public sector stakeholders has been building up the skills needed for the labour market and creating prospects within the country. Garment worker Salem Fadhloun is enthusiastic: ‘There is now no reason for me to risk my life trying to get somewhere else,’ he says. He speaks for many other young people, too. One figure in this issue relating to the situation of youth around the world really got me thinking: roughly one third of young people in both Albania and South Africa have no occupation. They are not attending school, have no other kind of training – nor are they earning an income. That figure is around five times higher than for Germany. So I wonder – what is occupying your mind? Accepting responsibility means acting conscientiously and realising that we have a duty. It means not looking away, but taking action. The real skill, however, is not only to pursue our own best interests, but to consider the wellbeing of others – to help in emergencies, for instance. That calls for strength, courage and stamina. The world today is marked by the forward march of nationalism and populism, by the increasingly unclear position of ­nations that used to be global powers with respect to international responsibility, by a weakened Europe and a huge number of ongoing conflicts. In this situation, Germany is needed, in conjunction with Europe, to uphold Western values. That is the conclusion of the ‘Germany in the Eyes of the World’ study, which GIZ has now conducted for the third time. About 150 academics, politicians, businesspeople and representatives of civil society and the cultural sector in 24 countries were asked how they see Germany. 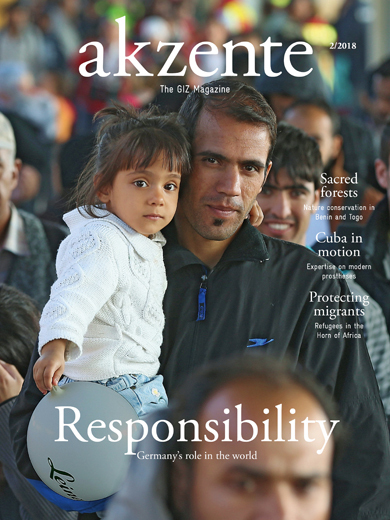 The study has prompted us to dedicate this issue of akzente to responsibility. In his essay, Indian politician and long-serving UN diplomat Shashi Tharoor leaves no doubt that ‘Germany must be a strong and reliable actor if the world is to successfully navigate the turbulence that characterises our age’. The country, he continues, must play a key role in strengthening multilateral institutions. We take a closer look at a project in the Horn of Africa to illustrate what it means to accept responsibility in the ongoing debate about displacement and migration. On behalf of the German Government and the European Union, GIZ is endeavouring to make migration in the region safer: it is supporting the establishment of medical facilities, training border management staff in first aid among other things, and enabling the judiciary and the police force to thwart the activities of human traffickers. This is no easy task, and one that attracts a great deal of criticism. Finding out how others see us, listening to them and questioning our own convictions – everything that we set out to achieve with our study on how Germany is seen is also part of the Congress-Bundestag Youth Exchange programme. Five young women and men report here on what they personally saw as an eye-opener. We hope that these diverse views and opinions on the concept of responsibility encourage you to reflect on Germany’s responsibility, our shared responsibility, and also the individual responsibility of every one of us. What do digital technology and international cooperation have in common? If we look at internet access statistics, the answer would appear to be ‘very little’. The vast majority of the 3.9 billion people who are still offline are in what is known as the ‘global South’. Two billion women still have no internet access. Nine out of ten young people with no internet access live in Asia, Africa or the Pacific region. The inequality between North and South that we already see in areas such as health care, education and nutrition – and which we refuse to accept – is mirrored in the field of digital technology. People like Nanjira Sambuli are determined to change this. The Kenyan works for the World Wide Web Foundation, whose aim is to connect more people to the internet. In her article – starting on page 18 – Sambuli calls for internet access for all. Lots and lots of people should benefit from digitalisation. Nobody should be excluded because of a lack of technology or due to social factors. The United Nations shares this standpoint: in the 2030 Agenda for Sustainable Development, the UN sets the goal of achieving universal and affordable internet access by 2020. But this goal can no longer realistically be attained, as shown by the diagram illustrating the digital divide on page 26. Would universal internet access make everything better? It is obviously not a panacea. In the magazine ‘trendradar_2030’, published in 2017 (trendradar.org/de/trendradar-2030), the scientist and expert in future technologies and trends Axel Zweck urges us to reflect on the impacts of every trend on humanity. Values play an important part in this. We must consider what we want a trend to be able to do, and what it might do to us. There can be no doubt that internet access initially brings more information and greater economic opportunities. But it is not only a blessing. Organisations like UNICEF have been warning us for some time of the downside of internet consumption. While parents in industrialised countries worry that their children are becoming isolated and depressive as a result of excessive internet use, that they are falling victim to bullying or abuse, parents in developing countries would do much to give their children the chance to access the internet. That’s our world for you. And that is why we need an in-depth debate about the opportunities offered by digitalisation – and the inherent risks. The debate should be global and should involve as many voices as possible from every country in the world. 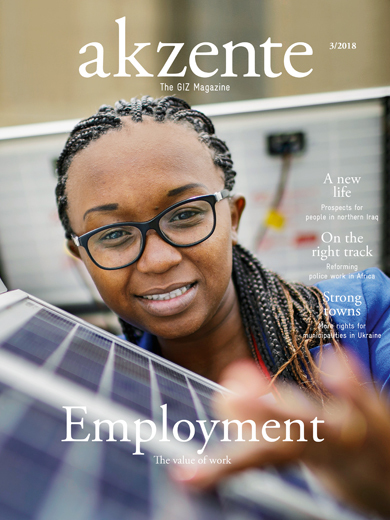 We hope that our akzente articles inspire you to reflect on your own position on the matter. In theory everything is clear, the battle lines are drawn: on the one hand, there are those who deny or trivialise the impact of ­climate change – led by the US President, who constantly criticises and threatens to withdraw from the Paris Agreement. And on the other, there are those doing everything to save the climate – scientists, politicians, ­entrepreneurs and the many environmental organisations who are raising awareness among the general public and promoting a more resource-friendly approach to energy use. Between the two sides stand the United Nations and a climate agreement, which will once again be the subject of debate in November 2017, when under the presidency of Fiji over 20,000 delegates from 197 nations will come to the table at the 23rd UN Climate Change Conference in Bonn in an effort to sustainably reduce harmful greenhouse gases. 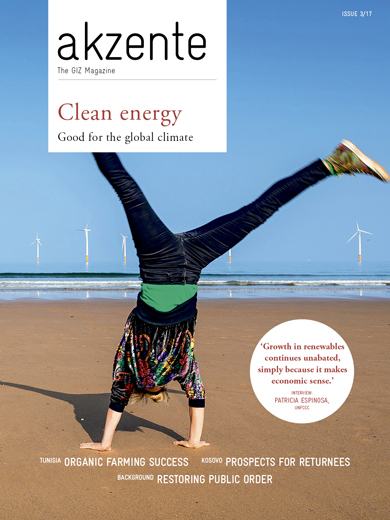 So why have we dedicated this issue to clean energy? Because people like energy expert Rainer Schröer are committed to the goal of enabling Chile to potentially generate 100 per cent of its energy from renewable sources in the not-too-distant future. Given the rapid developments taking place in the Latin American country, this is by no means as improbable as it sounds, as our report illustrates. Or because, despite many setbacks, Patricia Espinosa, the Executive Secretary of the UN Framework Convention on Climate Change, is seeing ‘unprecedented support’ for the fight against climate change, as she ­explains in interview. There are still plenty of reasons to continue to invest in environmentally friendly technologies and energy ­efficiency at the international level, says Espinosa. And there are also people like Imane Lemsafi, who features in our report from Morocco. As a recently trained energy ­specialist, she is working to help her home country realise its ambitious plans: by 2020 the Government aims to base 42 per cent of its energy production on alternative energy sources. Is this too fragmented? My personal view is that this combination of small and large-scale initiatives is exactly what is needed given the enormity of the challenge. Every initiative counts. And together they make a coherent whole. For the complex challenges set out by ZEIT editor Christiane Grefe in her essay can only be met by adopting such a diversified approach. Africa is full of surprises. Observers who focus purely on war, disaster and disease risk overlooking the many small signals emanating from Africa. For example, in 2017 ­Nigeria is taking part in the Biennale international art exhibition in Venice for the first time. The singer and composer Youssou N’Dour from Senegal makes regular appearances in Europe and, as Minister of Culture, has made it one of his priorities to bring ­internet access to more of his country’s people. One thing seems clear: Anyone who takes a closer look at Africa needs to break free of their preconceptions. Steering clear of ‘do-gooder’ and ‘romanticising’ tendencies is not easy. Particularly when it came to choosing the cover picture, we realised how difficult it is to convey the essence of this continent ­without slipping into cliché. In 1990, 47 per cent of people in developing countries were living in extreme poverty, in other words on less than USD 1.25 per day. Today, the figure quoted by the United Nations is down to 14 per cent. The number of children dying before their sixth birthday has more than halved in the same period, falling from 12.7 million to six million. The use of renewable energy has tripled in that time. These are positive trends – even if not all countries have developed at the same positive rate. Much of this has its origins in the United Nations’ Millennium Goals. Adopted in September 2000 by the General Assembly, the goals included halving the number of people living in extreme poverty and combating hunger. And yet there is still a tendency to view the current state of the world in a critical light. German economist Max Roser, a lecturer at Oxford, talks of distorted perceptions and offers an explanation: people tend to overstate the negatives. We interviewed him for this issue. Based on the long data series he analysed, Roser concludes that most people are better off today than in the past. But the number of armed conflicts is on the increase, almost tripling between 2007 and 2014 – this must, and should, give cause for alarm. Conflicts not only hurt people in the short term, they also damage a country’s development in the long term. Precisely for that reason, it is vital to have a compass to point the way forward, even in times of crisis. 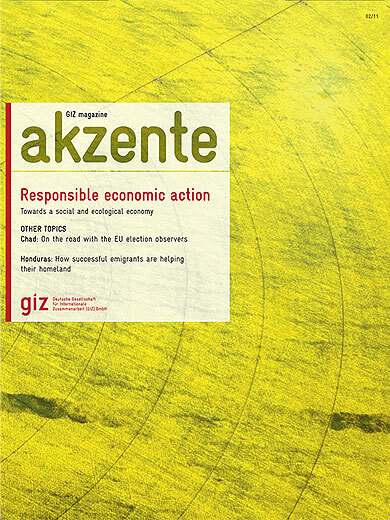 For Dagmar Dehmer, an editor for the politics section of Berlin newspaper Tagesspiegel, this means the 2030 Agenda for Sustainable Development, the topic of our In Focus section in this issue of akzente. In September 2015, 193 nations made a commitment to pursue sustainable economic growth that will increase prosperity without destroying the environment. They agreed on 17 goals to improve living conditions on our planet over the next 15 years – with a scope that encompasses making cities more resilient, promoting equality for women and strengthening state institutions, among other aims. Dagmar Dehmer’s conclusion: in these unstable times, the 2030 Agenda is more than just fine words. The same is true of GIZ’s work. Our articles about a young vocational school teacher in Afghanistan, cashew cultivation in Ghana and a reconciliation project in Colombia show how we too are guided by the Agenda 2030 goals. People in Botswana are now living around 10 years longer than in 2000. Rwanda, too, has made equally impressive progress on improving life expectancy. Both countries have invested in their health systems, established insurance schemes and worked hard in the fight against AIDS. These efforts have not only benefited each and every individual but have also boosted the resilience of the countries as a whole. A comprehensive and well-performing health system increases security and stability, as the German Government recently pointed out in its White Paper on Security Policy, which identifies epidemics and pandemics as one of 10 key challenges to state security. The world’s worst Ebola outbreak in 2014 destabilised entire regions across West Africa. Health, then, is not only about the individual, and it is more than merely the absence of disease. Alongside peace, good governance, respect for human rights, natural resource conservation and the fight against extreme poverty, a well-functioning health system is a bedrock for a life in security and dignity. Under the auspices of the German G20 Presidency, due to commence on 1 December 2016, health will be one of the main topics on the agenda at the July 2017 summit in Hamburg. At their meeting in Heiligendamm back in 2007, the G8 countries launched a 45 billion euro programme to combat AIDS, malaria and tuberculosis. At Elmau in 2015, the G7 countries pledged to boost research in neglected tropical diseases and also increased the funding for the Gavi Global Vaccine Alliance. 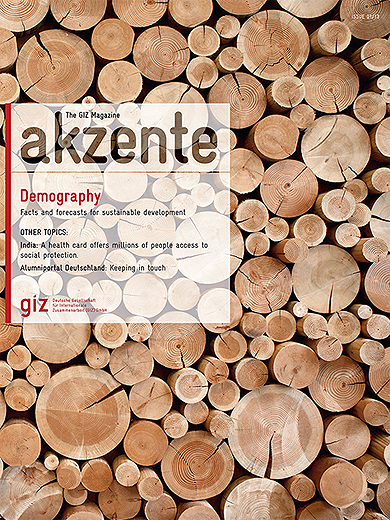 By focusing on health in this issue of akzente, we aim to provide some insights into this complex topic. We hope you will enjoy reading our cover story about business journalist Jana Schlütter’s visit to South Africa, where she discovered how text messaging can improve ante-natal care and how mobile phones can be used in information-sharing for better disease control. Health is a vital asset. GIZ has many years of experience in setting up health insurance schemes in developing countries, including Cambodia, India, Indonesia, Kenya and Rwanda. Millions of people for whom health care was unaffordable are now gaining access to doctors and hospitals – and that’s something I think we can justifiably be proud of. When Asia Khaled Salamed talks about her future career, her voice is ﬁlled with hope: as soon as peace has been restored in Syria, she wants to return home and use her newly acquired vocational skills to rebuild her country – ‘like the women who cleared the rubble in post-war Germany,’ she says. For this young Syrian, currently living in Jordan and training to be a plumber, work symbolises her hopes for the future. The future, albeit of a rather diﬀerent kind, is also epitomised by Work 4.0. This initiative, launched by the German Federal Ministry of Labour and Social Aﬀairs (BMAS), turns the spotlight on the future of employment – for the world of work is in transition. What kind of work do we want for tomorrow’s world? How is digitalisation changing our working lives? Which types of work will disappear – and which new ones will emerge? In the not too distant future, the Internet of Things will enable machines to communicate with each other and ease the burden of work, according to an interview with American author and software expert Martin Ford in this issue. But what if millions of people lose their jobs in the process? We could make things easier for ourselves if we followed the advice of the Chinese philosopher Confucius: ‘Choose a job you love, and you will never have to work a day in your life.’ But jobs are a scarce commodity in many regions of the world – especially jobs which oﬀer decent working conditions. According to the International Labour Organization, almost 200 million people are without work – and the number is increasing. Around 45 per cent of the world’s people are in precarious work – which means no social security or regular pay. In sub-Saharan Africa and South Asia, the ﬁgure is a staggering 75 per cent. Work is a multi-faceted issue; above all, it is beset with inequalities. 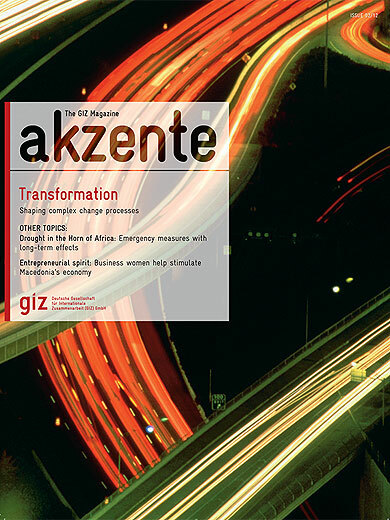 That’s why we chose it as the theme for this issue of akzente. We invite you to join business journalist Dirk Böttcher as he journeys through the world of work in his cover story. 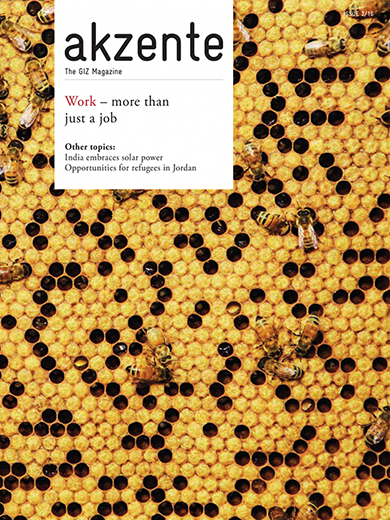 Read his account of what work means for the individual and how more jobs can be created in developing countries and emerging economies, and form your own opinion. Our studies of nature have shown us that homogeneity is risky. It can disrupt the delicate balance in the plant and animal world. And so we have long viewed biodiversity as something precious that we must nurture and protect. Even if our efforts often prove inadequate, we have at least recognised the benefits. But in society, things are different. Here we’re only gradually starting to appreciate the advantages of diversity and to grasp that the whole, i.e. cooperation between people with different genders, skin colours, religions, cultures and customs, is greater and more valuable than the sum of its many individual parts. This understanding does not always translate easily into practice, however. The arrival of around a million refugees in Germany in 2015 has made us very aware of how fragile an issue diversity actually is. How do we want to live? How many different people should we accept into our society? And under what conditions? On the one hand, the broad ongoing debate that has been triggered in Germany again highlights the positive connotations of diversity, with words such as abundance and wealth commonly used as synonyms. But when it has a direct impact on people and their lives, some less positive tones emerge in interactions with those who represent something different. At the same time, studies have shown that diversity can be a real driving force. It stimulates creativity and in turn provides the basis for innovation, which is so important in our globalised, digitised world. The more differences societies and companies embrace, the more productive they can be – provided we actively engage with this variety rather than simply take a passive approach. Diversity goes beyond upholding documented individual rights. Thus former US Secretary of State Madeleine Albright was spot-on when she said: ‘Diversity is what makes our societies richer in every single way...’. But we have to fight for diversity. 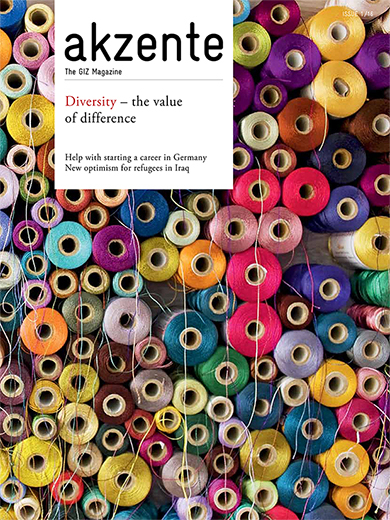 This is something that author Ingrid Müller from the Berlin Tagesspiegel highlights in the cover story, discussing both the demonstrated value of difference and the difficulties inherent in embracing diversity. For when people with different ways of thinking and living come together, tolerance is the order of the day, and this sometimes requires real strength. Muhammad fled Mecca, Friedrich Schiller escaped from Württemberg and Heinrich Heine sought refuge in Paris. These examples show that migration and displacement are as old as humanity itself. And yet this means much more than simply escaping danger. These words are wrapped up with notions of motivation and drive, and the idea of starting a new life. Because the arrival of refugees almost inevitably leads to change. There are many examples from our past: consider the progress of the United States of America since the 18th century or Germany after the Second World War. In the long term, the arrival of different people stimulated development. This is worth remembering, though of course we shouldn’t play down the immense challenges presented by the current refugee drama. Our author Jochen Stahnke from the Frankfurter Allgemeine Zeitung examines what lies behind the most recent refugee crisis and shows that the line between good and bad, between victims and people smugglers, is not always clear cut. 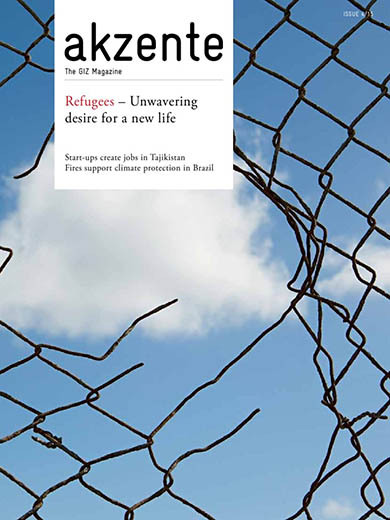 In this issue’s interview, Federal Minister Gerd Müller explains what strategies the German Government is pursuing and how it is tackling the root causes of displacement. And prize-winning author Saša Stanišić briefly reflects on his own poignant experiences of fleeing Bosnia. Our reports take you around the world: to Tajikistan, where starting a business calls for innovative ideas and a fair amount of courage. To Egypt, where job centres are being used to counter unemployment. And to Brazil, where controlled fires in the Cerrado savannah are helping to prevent even worse bushfires. Our app for tablets provides lots of additional interesting information, such as a picture gallery of famous refugees, a video to accompany the report from Tajikistan and a podcast about young Egyptians looking for the right job. We know about the ‘Inconvenient Truth’ (Al Gore). And we know that ‘the debate is settled’ (Barack Obama) and that ‘the science is clear’ (Kofi Annan). We are talking about climate change, a phenomenon that policy-makers and leading public figures now almost all agree ‘represents one of the principal challenges facing humanity in our day’ (Pope Francis). This is not simply a political nightmare that we will wake up from at some point, as some people might have hoped a few years ago. This is very real. At the end of 2015, the world’s leaders will come together once again in Paris at what may well be the defining conference. Will they find the strength to conclude a new, effective agreement on climate change? The rhetoric in the run-up to the summit is certainly positive, and the negotiating climate seems favourable. Everyone is looking expectantly at Paris, as are we. Our author Joachim Müller-Jung considers in his essay why not all of the grim climate predictions made over the last few years have come true. He also examines climatic changes that are already evident today and explores how people and countries are preparing for the negative impacts. Mary Robinson, the UN Secretary-General’s Special Envoy for Climate Change, explains in her guest article why all countries – both developing and industrialised nations – must now step up to the plate, albeit in different ways. Our reports from abroad focus on financial experts from Deutsche Bank who are supporting rice farmers in Thailand, young geriatric nurses from Viet Nam who are building a professional future in Germany, where they are badly needed, and strong female entrepreneurs from Mali. 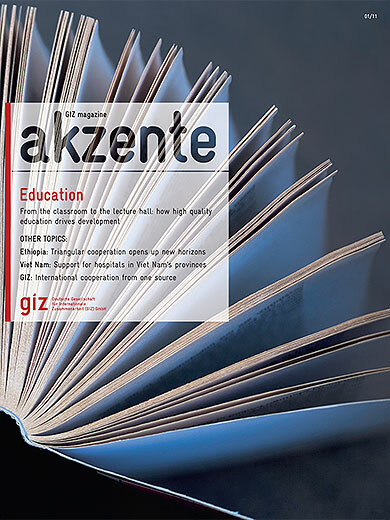 Our app for tablets now offers lots of additional interesting information on our akzente topics. For example, you can use the app to watch a video related to the report from Nicaragua. It shows how the arrival of electricity completely changed people’s lives in the village of Ocote Tuma. The best house is one that is open to everyone – so goes the saying from the famous story collection ‘One Thousand and One Nights’. And it’s true that life is brighter, more diverse and more interesting if we open ourselves up to the world. We expect our friends, partners and managers to adopt this attitude too, and the same goes for the politicians, business leaders and civil-society representatives responsible for making decisions. This is what we mean by transparency – systems that do not cut themselves off, but that let us in and take us with them; that do not build walls, but foster awareness and understanding. But transparency must also have its limits. If it paves the way for greater surveillance and becomes a means to restrict rights of the individual rather than strengthen them, then it has gone too far. After all, how many of us would want to be a ‘transparent citizen’? Even the best house has doors that need to be closed now and then. 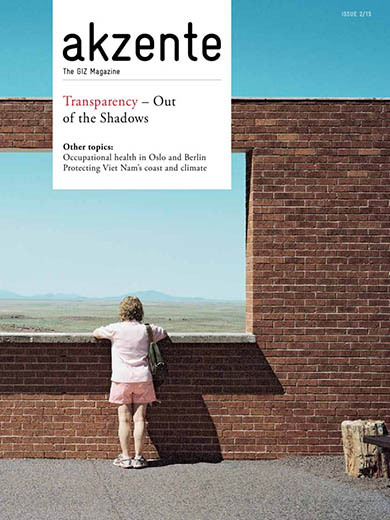 Our author Christian Hiller von Gaertringen takes a closer look at when more transparency is desirable and when it does more harm than good. Ultimately, it is a judgement call and one that we need to keep reassessing. In this issue’s interview, Christine Hohmann-Dennhardt, member of the Board of Management of Daimler AG, also discusses the fine line between the benefits and disadvantages of transparency in large enterprises. Our reports from abroad take you to Norway, the Middle East and Asia. We follow a Mongolian delegation visiting Oslo and Berlin, and meet a young pastry chef in the Palestinian territories. We also talk to two people who are making a fresh start after surviving the collapse of the Rana Plaza building in Bangladesh and travel to Viet Nam, where mangrove forests are helping to mitigate the impact of climate Change. Returning to the topic of transparency, GIZ itself has taken another important step in this direction, recently launching a project data portal on the GIZ website to provide facts and figures about our activities. Everything was better in the good old days. Who hasn’t heard this said once or twice, or looked back with fondness at the past? But why? Perhaps because, back then, we were young and the world was full of exciting opportunities. While the transition to adulthood shatters some dreams, it creates many others. There are more young people now than ever before – over 1.8 billion worldwide. They all want to participate, and should have the chance to do so. They need the freedom to shape their own lives. However, in many regions, this record-breaking generation is fighting the crushing feeling of not being needed, of having no hope of contributing to society and the economy. Our author Uta Rasche visited young people from Spain and Afghanistan. In the cover story, we discover how Muzhda Homa Bari plans to help her country and why Héctor Piedrafita moved from Villanúa to Otzberg. Despite facing tough conditions, both of them are trying to build a future for themselves. Dhieu Williams is also looking for recognition and prospects. His commentary examines what it means to come of age in crisis-hit South Sudan. 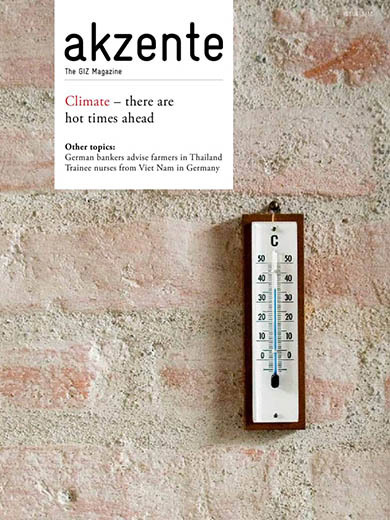 In this issue, the reports from abroad will whet your appetite with their focus on cream cakes, organic tomatoes and vanilla. In cooperation with private companies, we are strengthening vanilla farmers in Madagascar. 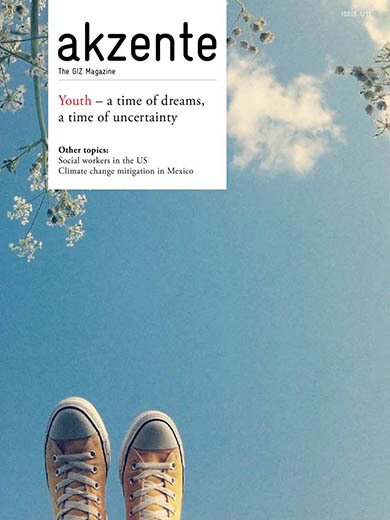 The report from Mexico shows how climate change mitigation can work on a small scale. We also talked to farmers in India who are now growing organic bananas, peppers and tomatoes. And we have another savoury treat for you – the launch of an akzente app for tablet computers. 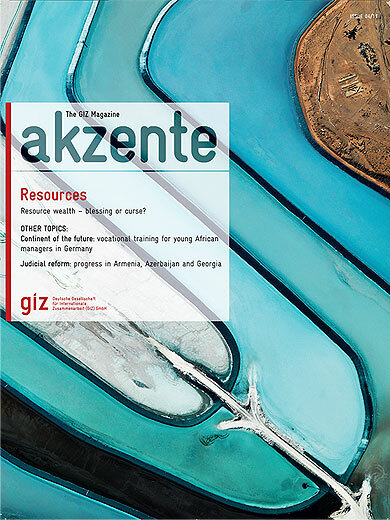 In addition, akzente has a fresh new look and some editorial innovations. So now you can experience all of this in both printed and digital form. Over half a century has passed since Robert Schuman and the other founding fathers laid the cornerstone for a common Europe. It has been a work in progress ever since. Time and again, the European project has been redeveloped, extended and renovated. So what stage has construction work reached today? Are we still excavating and pouring the foundations? Or are we already choosing the furnishings? Have building plans had to be modified? Is the structural design still holding up? How solid is the basic framework? Eurosceptics, today more numerous than ever, even question whether there is a common foundation at all. The stability and sustainability of the European Union also depends on its neighbours. In times of globalisation that does not simply mean those countries right next door. Conflict or natural disaster in any location in the world also can affect Europe. Security, climate change, energy supply – the seed for Europe’s credibility is being sown in places as far flung as Mali, Bangladesh and Brazil. Our cover story looks at the current status of the European ‘structure’ and identifies some of the challenges now facing the union – both internally and externally. As Gilbert Khadiagala’s opinion article shows, the EU model informs the architecture of other regional alliances. In this issue’s interview, Angela Filote, Head of the EU Commission Representation in Romania, also explains that the bonds of marriage are closer than ever despite the seven-year itch. 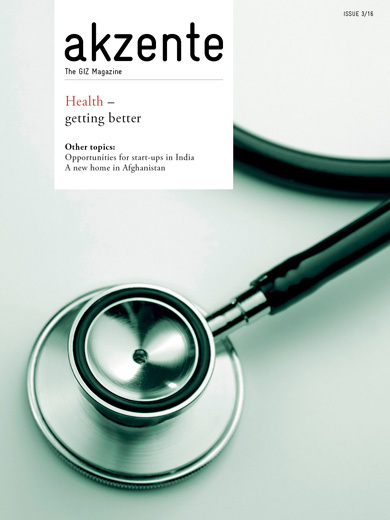 This issue’s reports from abroad take us to Chile and Afghanistan. A report from Georgia illustrates how women’s rights are being promoted. We also show how people in South-East Asia reclaimed their personal documents and birth certificates following the flooding caused by the tsunami. The internet, mobile phones and the opportunities for almost boundless communication and networking have come to dominate every aspect of our lives. The days when we had to fill out transfer slips by hand and take them to the bank to pay our bills are long gone. Today, we can communicate with people all over the globe with a mouse click or two. At home, we use our computers to shop or to trade shares on stock exchanges in distant parts of the world, and in the car, our navigation systems guide us to the nearest petrol station. 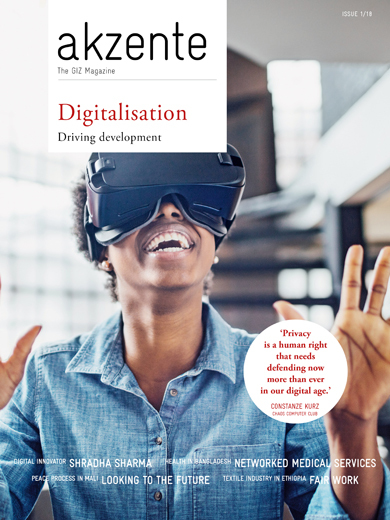 Our article ‘The divide is narrowing’ shows how the digital transformation is also making its mark on international cooperation. It reveals how information and communications technology and the new and social media are already being used to support sustainable social and economic development: to manage production processes across a number of locations, to provide weather and market information to farmers, and to offer online municipal services. And not only in Germany: this trend is particularly evident in developing and emerging countries as well. 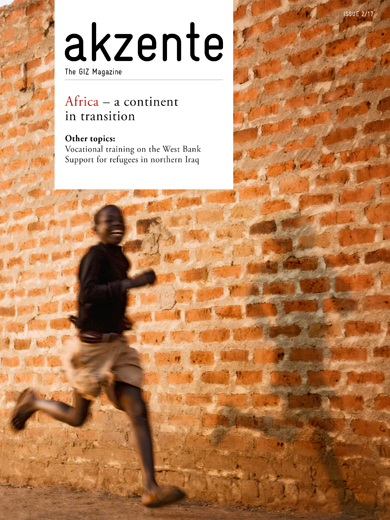 In this issue, our reports from other countries take us to Mali, Burkina Faso and Georgia, amongst others. We turn the spotlight on the African Union’s efforts to settle border conflicts between Mali and Burkina Faso, based on shared facilities that benefit people on both sides of the border. Georgia urgently needs to boost its exports to stimulate economic growth and is keen to bring its tradition of winemaking, which goes back thousands of years, into line with Western quality standards. We also talk to Germany’s Development Minister Gerd Müller, who tells us about his priorities in his new post. Read the interview to find out about his goals – and who he thinks will be World Cup champion in 2014. In Germany alone, 28 million people belong to sports clubs under the umbrella of the German Olympic Sports Confederation (DOSB). Sport sets things in motion – not just physically: the clubs affiliated to the DOSB see themselves as a broader social movement and are keen to engage with topics such as the integration of marginalised groups, community learning and social participation by children, young people and adults. Sport is also an important economic factor. Manufacturers of sportswear, equipment and merchandise employ hundreds of thousands of people around the world and generate billions of euros in turnover. Not least, major international events such as the Olympic Games and the Football World Cup attract a massive audience and are the focus of multi-billion-euro licensing and infrastructure projects. 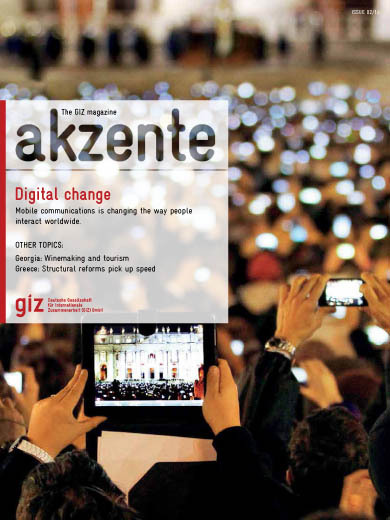 Both the economic and social aspects of sport are of great interest to GIZ and its clients. An increasing number of projects around the world provide advice on sporting activities for young people and utilise the opportunities that team sports in particular offer for health education, the development of social skills, violence prevention and conflict management. The development of national teams and association structures are a by-product. And more and more often, organisers of major events are asking for advice, with a view to generating sustainable results. 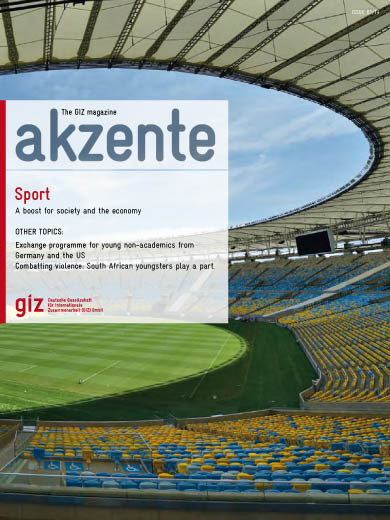 As the World Cup in Brazil draws closer, this issue of akzente therefore focuses on ‘Sport and Development’. Other articles take our readers to South Africa and Rwanda. In both countries, violence is a dominant feature of daily life. In South Africa, efforts are being made to involve young people – both the victims and the perpetrators of violence – in violence prevention. Rwanda will soon mark the 20th anniversary of the genocide which tore the country apart in 1994. We report on the Civil Peace Service’s commitment to assisting Rwanda in overcoming its trauma and promoting reconciliation. As critical consumers, we face this dilemma on a daily basis. Aware of the problems of globalised and diversified value chains – such as poor health and safety and fire protection in garment factories in Bangladesh and child labour on African cocoa plantations – we try as best we can to weigh up our purchasing decisions with ethical considerations. Now – in response to some extent to the dilemma facing customers – manufacturers and retailers are increasingly bringing production and product sales into line with sustainability issues and integrating social and environmental factors into their corporate strategies. Certification, labels and corporate social responsibility – a company’s willingness to be accountable for all aspects of its activities, not just at the operational level – are not simply a short-term matter, but a guarantee for future success in a growing number of sectors. People in countries like Germany can generally be confident about guaranteeing security for their own daily needs. We take our cars to be inspected, install smoke detectors in our homes, put security locks on our doors and take out fire insurance. A properly functioning civil society, trustworthy law enforcement officers and an independent judiciary take care of everything else. But for those living in regions of the world plagued by conflict and violence, things can be very different: the threats are too close to home and too omnipresent for people there to feel secure. In circumstances such as these, citizens first have to completely rebuild confidence in the state, its institutions and its security forces. The familiar cycles of conflict resolution through violence have to be broken. 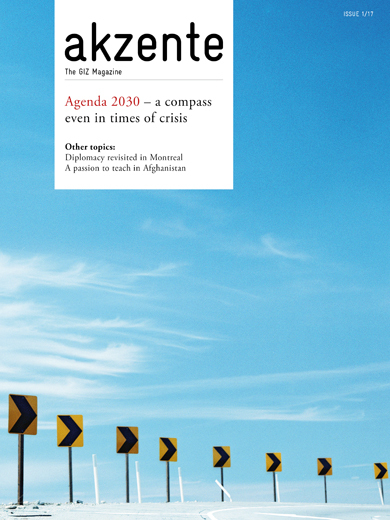 This is the focus of this issue’s editorial article, which sets out to describe the underlying framework and offer real insights into the situation in Afghanistan and in the Democratic Republic of the Congo. While we often talk about ‘feeling the ground disappear from under us’ in a metaphorical sense, the phrase is rarely used literally. And yet the uppermost surface of our planet, the ground on which we stand, is literally vanishing. In addition to losing agricultural land and forests through desertification, meadows are being covered over with asphalt and concrete on a daily basis as a result of progressive urbanisation and industrialisation. The farming industry is also experimenting with soil makeup, and the extractive industry continues to dig worldwide for mineral resources. Often several interested parties and industrial sectors compete for the rights to use the few available areas. It is becoming increasingly obvious that soil itself – just like crude oil, minerals and precious metals – could be a finite resource and not a renewable raw material. 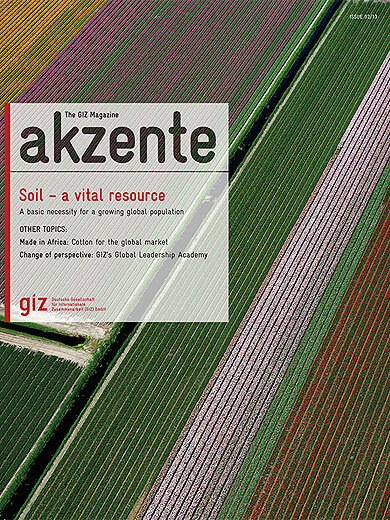 ‘The forgotten resource’, this issue’s feature article, shows what is really happening to the ground beneath our feet. How should we plan for the future? What facts and assumptions should form the basis for our ideas and decisions? Besides climate change, ongoing globalization and the fragile balance in current world politics, demographic trends are key factors which will determine the state of our world tomorrow. Some societies are ageing, while in others young people are in the majority but lack opportunities for training, employment and social participation. In some countries, people are leaving in search of a future elsewhere; rural regions are becoming increasingly desolate and cities cannot cope. In all these contexts, conflicts and unrest can ensue and can quickly reverse the progress achieved by even the most ambitious and successful development programmes. Our IN FOCUS article, entitled Megatrend: Demography, shows how demographic developments affect all aspects of international cooperation, and identifies some of the precautionary measures that societies can and must adopt in order to master the ensuing challenges. The findings and forecasts made by demographers can help in this context. Climate change features regularly on the political agenda – most recently at the Doha Climate Change Conference. The message about the need to ‘reduce greenhouse gas emissions and adapt to the unavoidable consequences of climate change’ may be a familiar refrain, but it remains very real. The roles and self-image of the key protagonists working to combat climate change have fundamentally changed in the space of a few years. Emerging markets, in particular, have now entered the equation. Where CO2 emissions are concerned, the economic performance of these countries presents them with problems similar to those already faced by industrialised nations. But it also offers an opportunity for them to finance their own climate activities as donors. New national and international funding mechanisms have been established, and the private sector is becoming increasingly involved in climate issues. Last but not least, the renewable energy revolution in Germany – in particular the Government’s decision to phase out the use of nuclear power – throws up many climate-related issues. Time then, to shed new light on the subject. For many people the financial and economic crisis has severely shaken confidence in the honesty and integrity of the financial sector. The key role played by the financial sector in developing the economy, society and the state has been overshadowed by the contorted image of unscrupulous dealings and speculation on the part of investment banks. And yet savings banks continue to provide urgently needed loans to consumers, provide start-up finance for new companies and operate current accounts for millions of people. Their specially developed financial products and funding instruments can even help leverage ecological and climate goals. The IN FOCUS article on ‘change agents’ reveals how stable and properly regulated financial markets support change, growth and progress. 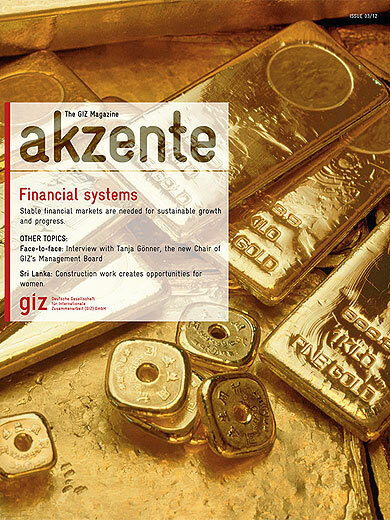 GIZ provides advisory services worldwide to governments and the private sector on shaping policy and legal frameworks for a responsible financial sector. Transformation is a concept that can be viewed from several different angles. 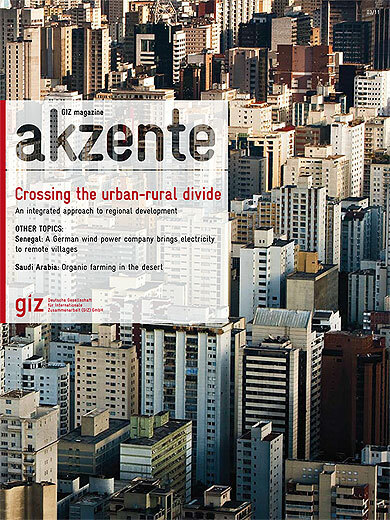 In this issue, we consider it from the perspective of urban development. Megacities like Tokyo, Mexico City and New York are subject to constant change. In addition to the political, economic and social tensions present in every major city, these metropolitan conurbations also offer enormous creative potential as centres of social life – potential that is there to be exploited by the economy, state and citizens alike. Continuous dialogue between government and society is the lifeblood of a functioning democracy. Popular participation is about much more than just voting in elections. It ensures that everyone – including disadvantaged groups – can articulate their needs, so that an equitable balance is achieved between diverse interests. 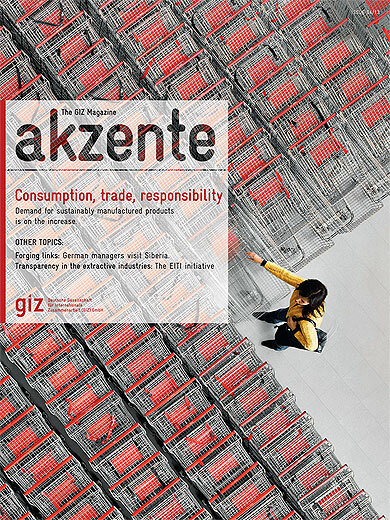 In the IN FOCUS section, we give you an insight into some of the many projects being implemented by GIZ in this context on behalf of the German Government. The article ‘Politics is for people!’ looks at the work we are doing in Tunisia, Bolivia and Zambia. What do you think of when you look at your mobile phone? Its good range of functions? The ability to check emails whenever you like? Optimum network coverage? Or are you more concerned with coltan, cobalt and palladium? Words like these are cropping up more and more in the media. And foreign as they may seem they are already a part of our everyday lives, because as materials for key components used in many high-tech products they are mineral resources we carry about with us all the time. When it comes to commodities, most people automatically think of the rising price of gold and silver, the dwindling reserves of fossil fuels and the worldwide search for those rare earth metals we need for economic and technological progress. And perhaps also of a desire to see some of the enormous profits generated by the extraction of raw materials finally benefiting people in the countries where they are mined. As the world’s cities continue to expand, more and more people are abandoning the countryside. But rural regions are also turning this phenomenon to their advantage. The relationship between cities and the countryside is complex, and where development measures in rural and urban areas are concerned one should not assume the two are diametrically opposed. The links between cities and the countryside are many and complex. Development works best when planners involve the local population and implement their concepts on a regional basis. Given the impact of climate change and scarcity of natural resources, it is becoming ever more urgent that we establish business and social models that are fit for the future. The orientation of national economies to environmentally friendly patterns of production, trade and consumption is not only a basis for sustainable growth; it can also establish conditions for reducing poverty and promoting prosperity worldwide. If we are to achieve a sustainable economy, policy-makers, business and civil society need to pull together. More and more countries – in the North and in the South – are facing up to the challenge. Education drives development. From primary school to university, from alphabet learning to vocational training – the term is as wide-ranging as the challenges involved in alleviating educational deficits in partner countries. How can we define education? What must we do to give as many young people as possible the chance of receiving a school education or vocational training? People who have received a sound basic education and vocational training have a better chance of leading a healthy life free from poverty. This not only helps the individual, it benefits society as a whole. So why isn’t ‘Education for All’ a universally established principle? 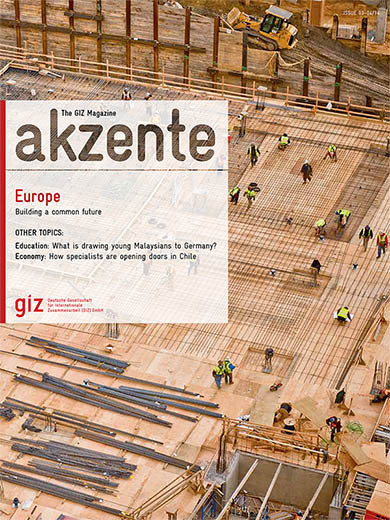 Please visit the GIZ publications database to download older issues of akzente - The GIZ magazine.